In this webinar, learn the importance of IT Architecture and how it causes organizations to be successful. There will be fifteen minutes of Q&A, so bring your questions for the expert to address. Written answers to all questions left unanswered will be provided to registrants post-event. Roger St Hilaire is an ICT Strategy and Governance Specialist with over 25+ years’ experience in information systems design, development, implementation, and training. 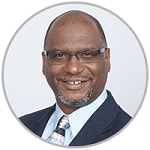 He has been CEO at RESH Global for over three years and served on various non-profit boards including chapter liaison for government collaboration in ISACA Trinidad and Tobago. Roger carries many IT credentials including Certified in the Governance of Enterprise IT (CGEIT)™, Certified Information Security Manager (CISM)™ and TOGAF® Certified, PSP Rainmaker® among others. His IT management career spans over 25 years in leadership roles across a wide range of industries. Roger is very active in the IT governance and architecture communities and works with organizations across the planet.